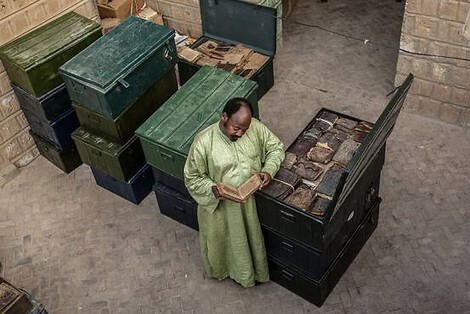 Abdel Kader Haidara, ein 51-jähriger Bibliothekar in Timbuktu, ist der Held dieser Geschichte. Als 2012 der afrikanische Zweig der Al-Quaida seine Stadt besetzte, versteckte er alte Manuskripte und antike Bücher an verschiedenen, sicheren Orten in der Stadt. Acht Monate lang waren er und seine Helfer damit beschäftigt, die Bücher zu retten. "[He] was especially proud of rescuing one manuscript: a crumbling volume about conflict resolution between the kingdoms of Borno and Sokoto in what is now Nigeria, the work of a Sufi holy warrior and intellectual who had briefly ruled Timbuktu in the mid-19th century. This man, Mr. Haidara argued, was a jihadist in the original and best sense of the word: one who struggles against evil ideas, desires and anger in himself and subjugates them to reason and obedience to God’s commands. It was, he thought, a fitting rebuke to all that the militants stood for."